Is the latest iPhone a big step forward, or just an iPhone 6S-S? The iPhone 6S was a "tock" model on the tick/tock cycle of Apple design: the ticks introduce new hardware, and the tocks improve the internals. That means the iPhone 7 is launching in a tick year. But from outward appearances at least, the iPhone 7 is another tock. Are appearances deceptive? Let's find out. The iPhone 7 looks like the iPhone 6S. There are differences, but they're subtle: the almost-disappeared antenna lines, the new, solid-state Home button, the move from space grey to plain black. But there's an interesting new color option, a glossy Jet Black, and there's a big change to the overall design: the headphone jack is no more. That's bad news for iPhone musicians and for anyone who likes listening to wired headphones while charging their phone, but you do at least get a Lightning-to-3.5mm adapter so you can use your existing headphones. The iPhone 7 is also stereo, cleverly utilizing the earpiece speaker for a second stereo speaker. Apple says it's twice as loud as the iPhone 6S. The disappearing headphone jack has also enabled Apple to make the iPhone 7 water and dust resistant to IP67. The move to Lightning means that the earbuds are now Lightning too. Apple would no doubt recommend we go for their innovative, expensive and eminently lose-able wireless AirPods, which will cost around £160 and will go on sale later this year. The iPhone 6S has a retina display, and it delivers 1,334 x 720 pixels at 326ppi. It's crisp, but it lacks the fine detail of the much denser AMOLED panels in high-end Android devices. The panel is a backlit IPS LCD, and it has 3D Touch to recognize hard presses on icons. The iPhone 7 display looks identical, because it largely is. It's brighter, though, with 25% more brightness, and it has a wider color gamut for better color reproduction. But it still looks a bit old-fashioned compared to the Super AMOLEDs of Android flagships. Apple designs its own SoCs (System on a Chip) rather than use off-the shelf Snapdragons, and the iPhone 7 has the latest A10 processor. The A10 Fusion is a quad-core processor with two high-performance cores and two energy-efficient cores and a dedicated processor deciding which cores should do what. Apple says performance is 40% better than the A9 processor, and that the processor is more energy efficient too. The iPhone 6S processor is an A9, a dual-core 1.8GHz processor with six-core graphics and 2GB of RAM. Storage options are 16/64/128GB and as ever, there's no microSD slot for additional storage. With the iPhone 7, Apple finally dropped the completely useless 16GB option. Storage tiers are now 32GB/128GB/256GB, unless you want Jet Black. That isn't available in the 32GB configuration. The iPhone 6S shipped with iOS 9 but will get the free iOS 10 upgrade this month. The iPhone 7 runs iOS 10 as standard. The iPhone 6S abandoned the megapixel race in favor of better quality, so while the 12MP sensor doesn't look great on paper it's a genuinely good smartphone camera. Its Live Photos added some fun to family photography and it's capable of shooting 4K video at 30fps. It's just a shame that Apple decided to keep the optical image stabilization for the larger and more expensive iPhone 6S Plus. The iPhone 7 gets optical stabilization this time, and its aperture is improved to f/1.8 for better low light performance. The TrueTone flash now has four LEDs and can compensate for flickering artificial light, and the FaceTime camera delivers 7MP with stabilization. Once again the best camera is reserved for the bigger and pricier Plus, which gets a clever dual-camera setup. Apple likes thin, and that means the iPhone 6S has to get through the day with just 1,715mAh of battery. It manages it, mostly, but it's disappointing compared to rival devices and Apple's own iPhone 6S Plus. The good news is that the iPhone 7 addresses that, achieving Plus-style battery life without the bulk. Apple says you can expect an extra two hours of daily use from the iPhone 7 compared to the iPhone 6S, and that some people will get even more than that. 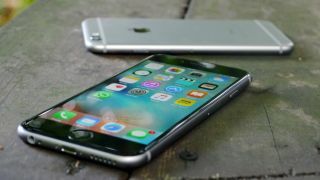 The iPhone 6S has been on sale for a year, and up to the launch of the iPhone 7 it was priced at £539 ($649, AU$1,079) for the 16GB version, £619 ($749, AU$1,229) for the 64GB and £699 ($849, AU$1,379) for 128GB. The iPhone 7 will go on sale on September 16th, with pre-orders going live on the 9th. The 32GB version costs $649 (£599, AU$1,079), 128GB is $749 (£699, AU$1,229) and 256GB is $849 (£799, AU$1,379). It's a tock, but it's a pretty big tock: the camera and battery improvements address the key criticisms of the iPhone 6S, delivering the benefits of the Plus model without its trouser-threatening size - although price-wise the new iPhone 7 is only £20 less than last year's Plus price. But we predict a big change is coming next year, so if you're happy with your current iPhone there's little reason to upgrade just yet - and waiting another year means you'll be able to save up for some decent wireless headphones too.